The Lil Divas love mommy-daughter dates. They also love to reminisce and share memories. This gave me the idea for a game that combined getting active with some of their favorite things - mommy time and sharing memories of special moments spent together as a family. I grabbed a beach ball (yes, I keep these on hand for learning and fun) and my sharpie and got ready. I thought up a few questions and wrote them all across the beach ball. Then, I invited the Lil Divas to play. Playing with a ball is always fun. It inevitably leads to missed catches, giggles, bumps on the head, falling on the floor and lots and lots of laughing. 1. What is your favorite treat to eat? 2. Say 1 nice thing about everyone playing. 3. 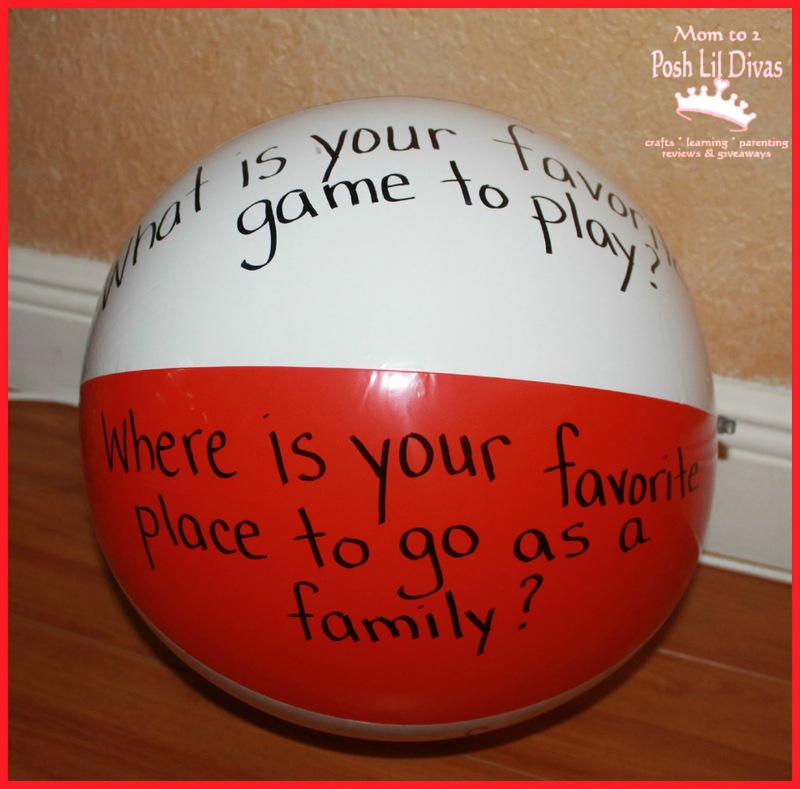 Where is your favorite place to go as a family? 4. What is your favorite family trip? Why? 5. What is your favorite game to play? 6. If we could go anywhere in the world, where would you want to go? Then play catch, taking turns so that everyone gets a turn catching the ball. Wherever your hands land on the ball, that's the question you need to answer. If you have already answered the question your hands are on then answer the question nearest to them. Play until everyone has answered all the questions. The Lil Divas enjoyed playing the game and reading (sneaking in some literacy!) and answering the questions. They really liked hearing my answers too and it was fun to play and share together. As a mom my favorite was the one where everyone had to say something nice about the people playing. 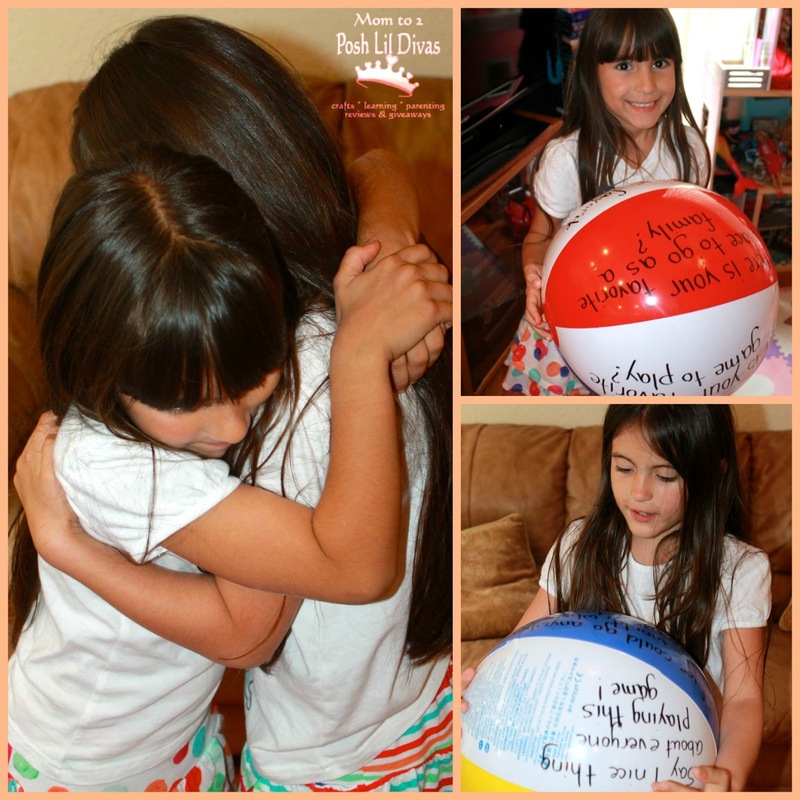 It was very sweet and actually led to the cute moment pictured above of the Lil Divas hugging. The Littlest Diva was touched by what her big sister said about her and ran over to hug her. It made my mommy heart full to bursting. I can see this being a great game to play every now and then as the answers will undoubtedly change as the Lil Divas experience new things. I look forward to revisiting this game in the future with the Lil Divas. 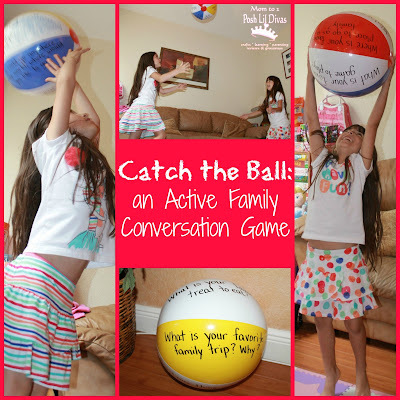 This idea is being shared as part of the Mommy Playdate 100 Days of Play hosted by Sun Scholars and Life at the Zoo. 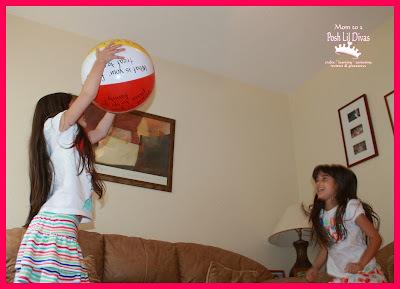 100 blogs/bloggers from around the world have taken on the challenge of connecting with our kids through play and are sharing our ideas with you from April 1st thru July 9th. We hope you find some ideas that inspire you to play and connect with your kids. I agree with Rachel that this is a fantastic idea :) Thank you for sharing this! I love this!!! My toddler is a bit to young, but you better bet I'll be pinning it for when she gets bigger!